What is it like to leave gasoline behind? Wear gloves but have to use a touchscreen? 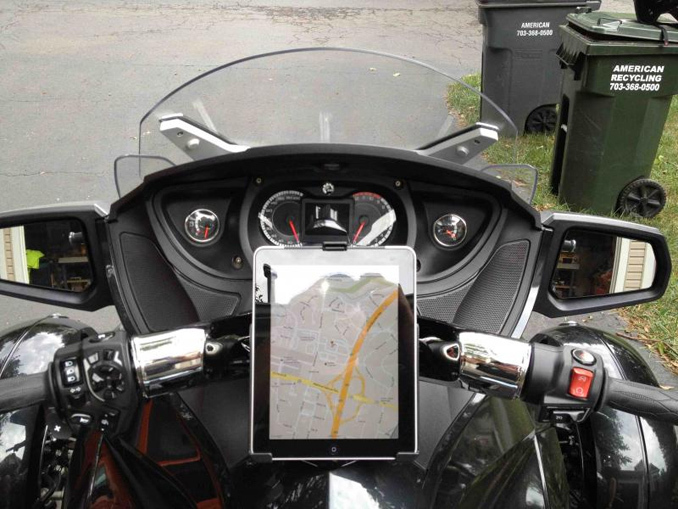 Even before riding the Current Motor Super Scooter, there was a good reason to be in need of a way to operate a smartphone while riding a motorcycle. RAM Mounts, made by a Seattle company, give riders somewhere to attach their GPSes, smartphones, radios, cup holders, or whatever else to their bikes where they can be seen and easily reached. Tank bags have been a half-solution for a long time—you can see your GPS through a transparent plastic window on the top of your tank bag, but you couldn’t touch it. Even before winning the scooter, I had ordered two X-Grips to mount my Windows Phone onto my handlebars for use as a GPS and a speedometer. Two because they had different mounts and I didn’t know which would fit the bike better. Fortunately two because I can now put one on each bike. Wait, why get a speedometer for a motorcycle that already has a speedometer? So what’s the problem with gloves and touchscreens? Touchscreens for early laptops, tablets, PDAs, smartphones, and GPSes were pressure sensitive. You could use your finger, fingernail, pencil, or even a gloved finger to operate it. Now new touchscreen devices are capacitive, requiring flesh and blood to press successfully. Lots of startups have been trying to meet the needs of people trying desperately (and unsafely) operate their smartphones or tablets without exposing their fingers to the cold. Many have come to market with custom gloves that are great for most everyday purposes, but those proprietary gloves and mittens aren’t what you find protecting motorcyclist’s or snowmobiler’s hands. Made by a company that understands that people are already wearing their favorite gloves and don’t want to buy a whole new pair just to text with them, these are add-ons to existing gloves that have the required electrical properties that make them work with capacitive touchscreens. Each ThumbDog fits over one finger of your glove to give it that magical touch. Use two to conquer zoom and pinch maneuvers. Use three to…I don’t use three at a time, so I’ll leave that up to you. Terry Richards of Current Motor sent me a sample he’d picked up at a motorcycle show in Indiana, and I’ve been meaning to write about it, so here you go. Thank you, Terry! Wait, why would he send me that? Because the Super Scooter has a capacitive touchscreen that doubles as its speedometer and charge meter. One must be able to press it to switch from speedometer mode to charge meter mode—but “must” is too strong a word, as there’s no reason to switch to charge meter mode while in motion and no reason to show the speedometer while plugged in. There’s not a lot of functionality in the digital dashboard’s UI as I see it, but because it’s an Android device, there’s lots of potential for other applications. What did I do before ThumbDogs? Over the winter, I experimented with metallic thread and metallic fabrics (lamé), trying to sew some spare metal buttons I’d found in a travel sewing kit onto the pads of my left motorcycle glove thumb and index finger. The tip of a $2 capacitive stylus I attached with metallic thread onto my right index finger. The lamé was hilarious—a coarse gold finger brightly covering my left index finger on a black motorcycle glove that was almost embarrassing to wear. It was also very inaccurate, because the fabric was not snug against my finger, producing either too small of a contact against the phone or too much contact, both of which the touchscreen either ignored or reacted incorrectly to. At least it was easy to sew onto the finger. I just don’t have training in sewing or cutting fabric into shapes. The metal buttons worked, but weren’t tightly enough attached to my fingertip to make clicking accurate, and they threatened to scratch my phone’s screen. For found objects, they were worth trying. The capacitive stylus rubber nub was the most successful experiment because it kept its shape and the size of its contact patch well, attached firmly to my gloved finger, and I could feel where it was through the glove. It was therefore easy to use, accurate, and unlikely to slide or fall off. Also, it was cheap, at $2 each (not counting the cost of the spool of metallic thread), but labor-intensive to attach, because I first had to break the stylus to salvage the capacitive material. It’s still attached to the index finger of my right glove, so I can do things with it while I’m using my left hand to operate a motorcycle’s clutch or the scooter’s rear brake (at a stoplight of course). The ThumbDogs do their job well, but there’s a risk of them falling off. At about $15 for a pair, that can add up. I haven’t sewn them onto my gloves yet, but have used small safety pins to hold them on, instead. Rather than damage or affect the electrical properties of the capacitive material, I poked the safety pin through the label/tag. After getting used to the sample Terry had sent me, I went online and bought four more (two pairs @ $15 each with a slight discount provided on the promotional code on the sample’s packaging), so that I could either equip thumb and forefinger on both gloves of one pair, or one glove of two pairs. I have a a thin pair of black Held gloves, which I used for the sewing experiments, and a thicker pair of Gerbing’s S2 battery-heated gloves which protect my hands better during the colder months. The problem with wearing ThumbDogs on the Gerbing gloves…well, there is no problem with wearing them, but with attaching them to the gloves. Gerbing’s Microwire technology means that there are lots of little wires embedded inside the glove that produce the warmth, like a car’s rear window defroster. I worry that sewing or pushing a safety pin through the glove to attach a ThumbDog will damage the heating wires. From my experimentation, I’ve found that rubber bands or string are not a great solution either because they constrict the fingers, reducing blood flow and leaving them cold. Oh, well. I haven’t lost the one ThumbDog I put on my Gerbing left glove yet. Any problems with the ThumbDogs? Yes. I’ve already mentioned that they could fall off if you’re not careful. Before they do fall off, however, they will become less effective on touchscreens. How? If the ThumbDog is not tight against your gloved finger, then the loose material might present a different size or shape of the contact patch where your gloved finger meets the glass of your smartphone or tablet or GPS. Even if a material has the correct electrical characteristics, if the shape or size of what touches the glass is not the same as the shape or size of your finger, then your results will vary. Pushing a floppy ThumbDog (or lamé) to the glass might be mistaken for a click in the wrong place, a double-click, a slide, or a zoom gesture…all unintentional. The remedy is to make sure that each ThumbDog is snugly attached. Before I learned this lesson, I thought that the product was defective. Because the ThumbDog attaches to a gloved finger instead of a real finger, it is easy to overlook how tight or loose a fit it is. You know what a loose glove feels like, but you don’t often wear gloves over your gloves, so that takes some getting used to, like wearing two layers of T-shirts and wondering why it looks wrinkly all the time. I recommend ThumbDogs. They work (when worn snugly). They fit thin and thick gloves (using an elastic material). They’re expensive (if you lose them often because you don’t attach them securely), but less expensive than buying a whole new pair of gloves. And they look better (than some cheap scrap of gaudy 80’s cloth clumsily sewn on with metallic thread to conduct the electrical properties of your skin). Yes. Someone told me that Best Buy used to sell something called Digits for $10 ($12 from the manufacturer’s web site), but they were out of stock. The idea is similar to my experiments: attach something conductive to the fingertip, but poke a hole to the inside so that it’s also in touch with the finger. The key problem with this kind of product is that, unlike ThumbDogs, they don’t have a material that simulates your body’s electrical properties. To get your body’s electrical properties to the surface of the glove, they have to have some piece of metal pierce the inside of the glove to connect it to a pad on the outside of the glove. The advantage of a ThumbDog is that it works without the need to be in direct electrical contact with your skin. This entry was posted in Motorcycle, Person, Praise, Technology. Bookmark the permalink. 1 Response to Wear gloves but have to use a touchscreen?